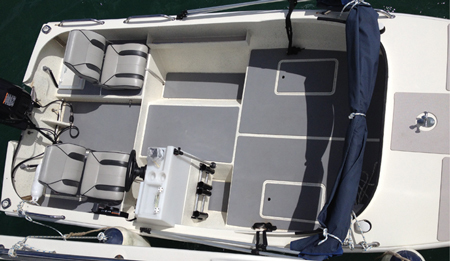 "The boat performed very well, even got on the plane on one motor. cruises comfortably at 22 knots with a top speed of 27 knots. We launched in Pumicestone Passage and cruised out against 20 knot south easterly winds with 1 metre chop. Ride was very comfortable. Peter & I are very pleased with her and we are planning on a few more trips across the bay." Shipping a tender of this size to the other side of the world requires some planning. There are certain restrictions concerning the packing. If using timber to costruct the frame for the crate, it must be graded for this purpose to comply with the customs inspections. The crate for this boat has been made from alluminium which cannot harbour grubs or insects etc. Special care has been taken with how the boat is supported and held inside the crate to avoid any damage. It will now be cladded prior to pick up. "The weight distribution is good, no cavitation and would not change a thing, runs well with great fuel economy. She beats anything when there is some chop happening, I love it!"